My name is Ben Lesser and I am a survivor of the Holocaust. On June 17, 2006 our grandson Adam Gerber graduated from U.C. Davis. The whole west coast family attended the graduation. Afterwards we celebrated his success for a couple of days in Davis. Adam had made arrangements to tour Europe for a month after graduation and before he settles down to his new job in San Diego, California with Hillel, at U. C. San Diego. At the same time our oldest granddaughter, Robyn Kramer made arrangements to tour Italy so Adam and Robyn decided to rendezvous in Krakow, Poland and were to meet on Tuesday July 11th. They were to meet at a certain restaurant at a specified time. A few days after they had made their plans I received a call from Robyn asking me about certain places and addresses in Krakow, the place of my birth and where I grew up in my previous life. While conversing with me Robyn happened to mention how nice it would be if I could also be there with them to show them around the area. Jean and I were in Krakow approximately 10 years ago and both of us decided never to return to this accursed land where the soil is soaked with innocent Jewish blood. That trip was to be our last and only visit after the Holocaust. It was a most traumatic experience, which at that time I felt that I had to endure in order to have closure. But now my grandchildren were going to Krakow in order to find their roots, how could I possibly refuse that kind of an overture or request. 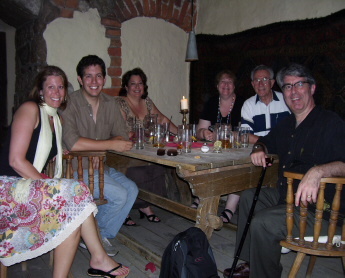 That is when I decided to invite the whole family to join us on this rather impromptu trip to Poland: AKA PILGRIMAGE. Robyn and I agreed to keep it as a surprise to Adam..
My loving wife Jean encouraged me to do this without her, because of the traumatizing and lingering effect our last visit had on her. I am thankful that my daughters Sherry Kramer, Robyn’s mother is joining me, along with my other daughter Gail Gerber and my son-in-law Michael who are the parents of Adam Gerber. Adam and Robyn are the ones who started this whole pilgrimage in motion. My other two granddaughters, Jenica Gerber and Cindy Kramer and my son-in-law Larry Kramer and my sister Lola Lieber were unable to join us at this time. So, here I am on a flight on Southwest Air Lines, about to land in Los Angeles, writing these memoirs in anticipation of meeting my daughter Gail at the airport. OOPS! We have just completed a bumpy landing. Gail picked me up at the airport. We spent a whole day together taking care of last minute chores. We ended the evening with Michael and Jenica having dinner at Marmalade at Farmers Market. The next morning, the taxi cab with Michael and Gail in it, pulled up at exactly 5:30 A.M. We went directly to LAX and it took us over an hour to check in. By the time we got to the gate, it was 7:45 A.M. They were already boarding and we were successful in getting upgraded to Business Class, at least for our first leg of this trip to New York (JFK), where my daughter Sherry will join us. While on the flight to New York Gail handed me the latest e-mail which she had received from Adam. He is having the time of his life touring Europe, going from one country to another. It is absolutely wonderful to read about his escapades. It’s like reading a beautiful novel. I never knew that I had such a talented writer for a grandson. In his writings he mentions how he can hardly wait to meet Robyn on Tuesday in Krakow, so that he could personally share and tell about his adventures to a family member. I can hardly wait to see the shocked expression on his face when he is escorted to a table in that prearranged restaurant and sitting there is his father, mother, grandfather and Aunt Sherry. I only hope that we can capture on our video camera that surprised look on his face. After picking up Sherry in New York, we flew to Brussels and arriving there the next morning. Gail arranged for this huge Mercedes van and she volunteered to drive to Brugge. On our way to Brugge we got side tracked and wound up in a town called GENT. We were so impressed with this town that we wound up wandering from street to street and admiring the scenery, until we came upon a square—where they just happened to have a flea market. That was it for Gail. We parked the car and spent several hours browsing and enjoying the ambiance. We ordered lunch at a sidewalk café, listened to the wonderful oompapa marching band, tasted some of their local brews and departed happy and pleased after this impromptu adventure on our way to Brugge. After a short drive, we arrived in romantic, historic Brugge, with its narrow cobblestone streets and beautiful canals with those ancient bridges. It was as though we were transported back to the past and we have suddenly been awakened in medieval times, in this little hamlet where the streets were so clean, that we did not have to worry about the black plague. The only thing that was missing was the knights jousting and the fair ladies peering out of their windows. The only sounds that you heard were the clip clop of the horses pulling their buggies down the cobble stone streets and the geese honking as the waters of the canals gently lap up against the stone piers. The next morning we were suppose to be woken up at 5:15 A.M. At 5:30 I checked my clock and no one had called. When I called down to the front desk the man answered and sounded half asleep. I reminded him that he was supposed to have woken us. I guess I woke him up. Instead, he tells me that he is supposed to wake us at 5:15 and I pointed out that it was already 5:30 A.M. – oh ya ya ya. Sorry! We then found out that our van was in the garage and the garage will not open until 7:00 A.M. and we were supposed to leave at 6:00 A.M. With some persuasion, the key keeper from the garage was called and he released our van. Gail drove us to the airport in Brussels and again we made it by the skin of our teeth. She drove that huge van like a real pro. We flew from Brussels to Warsaw. It was a real easy flight except that we had a long schlep going from the International terminal to the Domestic terminal. Again we had to go through the security line and then we had an approximately two hour waiting period. The flight to Krakow was also very pleasant. When we arrived to the hotel, Adam was in his room resting and waiting for his cousin Robyn to arrive. Somehow our reservations were all mixed up and the only rooms they still had available were ones on each side of Adam’s room! Obviously we had to be very quite. Our meeting was at 8:00 P.M. at 35 GRADZKA AT POD ANIOLAMI (UNDER THE ANGELS), which is one of Krakow’s most famous and popular restaurants. It is located in a large 13th century cellar. We took a table for 6 next to a table for 2 where Robyn and Adam were to be escorted. But as soon as he walked in the cameras started clicking. He was completely taken by surprise. He almost freaked out. It was a great surprise and after a delicious genuine Polish meal we made our way back by foot to the hotel.